Help Tony Stark a.k.a. Iron Man to fly through the city and to save it from the invasion. Destroy the enemy vehicles, helicopters and planes and try to survive on your own. Press LMB to shoot. Are you ready for a big adventure? P.S. Enter the codes RESCUE and PATRIOT to unlock new Iron Suits. Good luck! 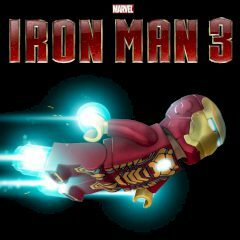 Do you like the amazing adventures of the brave hero Tony Stark, or Iron Man? In this flash online action game your task is control his flight through the city and to destroy all enemy helicopters on his way. This will not be so easy as it seems, but if you will persistent and brave enough, you will surely manage to do it. We wish you good luck and much fun with this free online game brought to you by Lego! Play How Well Do You Know Iron Man?